Deri Jones & Associates Ltd and Geospatial Survey Solutions Ltd (DJA/GSS) carried out a laser scanning survey of an early Georgian mansion in Mid Wales on behalf of Architects Lionel Curtis and Rory Wilson (LCRW). Over a period of 16 days, DJA/GSS carried out over 270 scans and some 180 total station surveys, recording over 5500m2 (59,000ft2) of floorspace and grounds in a data set of 3.5 billion full colour points. 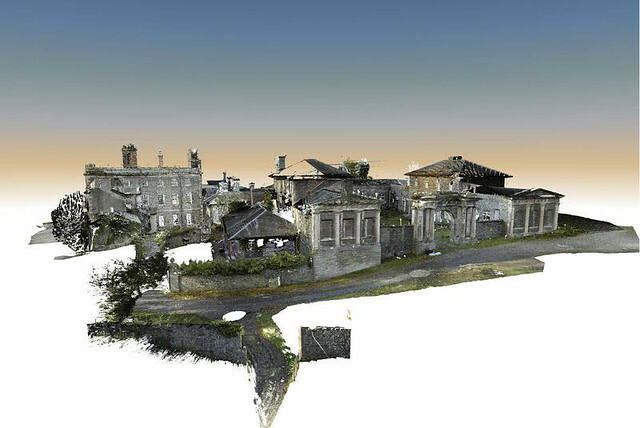 Combining the range and resolution of the Mensi GS200 with the speed and portability of the Faro LS880, DJA/GSS supplied 2D CAD floorplans and elevations, a 3D space claim model and over 60Gb of processed scan data along with viewing software. Nant Eos Mansion (which translates from the Welsh as "Nightingale Stream") is an early Georgian Mansion built in 1739 on the site of an earlier dwelling. 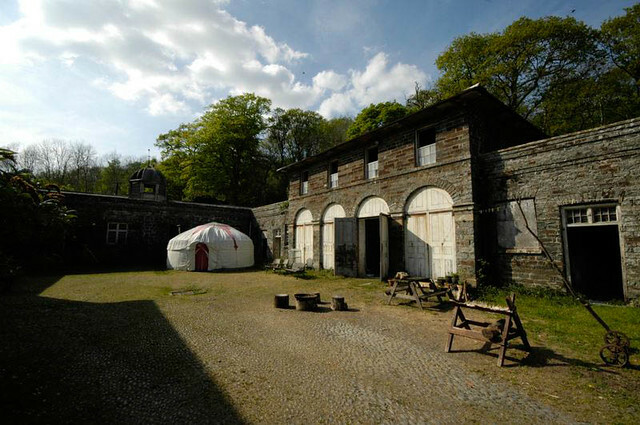 Undergoing the usual extensions and developments associated with country mansions gaining wealth from the industrial age (lead and silver mining in the case of Ceredigion), it consists of a house complex and large stable block. There is evidence for a building on the site from the 14th Century and Gerald Morgan's book "Nanteos – a Welsh House and its Families" documents the history, intrigue and development of the existing building and its estate. Nant Eos is most famous for it's reputation as allegedly one of the last resting places of the Holy Grail, after a daring escape by monks from Glastonbury Abbey to the nearby Strata Florida Abbey during the dissolution of the Monasteries in the 16th Century. 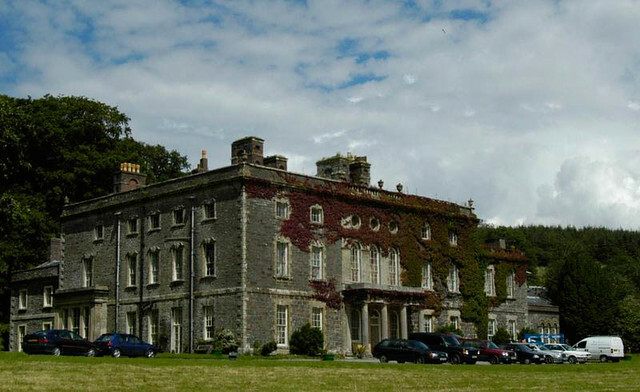 Now undergoing restoration by a team led by LCRW architects, Nant Eos Mansion is an important part of the history of Ceredigionshire and Mid Wales. 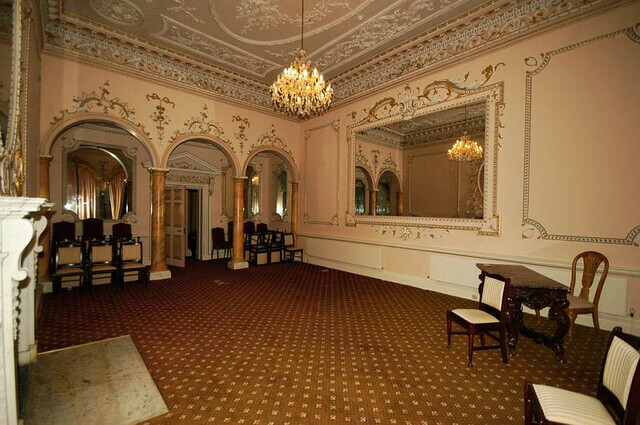 Following an initial site visit with Lionel Curtis of LCRW, DJA/GSS assembled a method statement for surveying the house and stable block with as much flexibility in the sequence of rooms to be scanned as possible, to accommodate the conferences and guests that were hosted. Overall, the DJA/GSS team collected some 274 scans, 180 total station survey stations and some 3000 Digital SLR images during the 16 days spent on site. The external elevations of the buildings were scanned using the Mensi GS200, allowing good coverage of the rear elevation from scanning stations cut in to the heavily vegetated rear slope behind the building. Scanning here was carried out at a range of approximately 70m, showing the benefit of combining the Mensi and Faro units. Areas shadowed from the Mensi were scanned using the Faro LS880 and tied in to the overall data set using a combination of spherical targets and total station traverses. All scans were tied in to a master set of survey points aligned to the main elevation of the house using a mixture of resectioning and traversing throughout the 100m x 60m site, providing an accurate 3D control grid to work to. Working around the Mansion's schedule as hotel and conference centre, the 30 main rooms used on a daily basis were scanned using the Faro LS880. Sometimes requiring more than one scan per room to capture detail areas, the portability and speed of the LS880 were key in minimising the disruption caused. Once the main areas of the house were completed, scanning continued to the unused areas, where another 47 rooms in the main house and 31 rooms in the stable blocked remained to be scanned. Again, these scans were combined using a mixture of targets, total station resectioning and traverses and tied in to the master control network. Accuracy for location of scans internally was generally <8mm, with maximum errors of around 15mm for scans in areas where it was found to be impossible to create closed traverse loops. Processing of the scan data was ongoing during the on site work. Total station data was imported, checked for accuracy and correlated to the master control network, then imported to Faro Scene to act as reference control for the importing of scans. The buildings were broken up to smaller units to allow parallel processing of the data, with typically 30 scans per Scene file. Mensi data was imported to Faro Scene and then all data was registered, checked for accuracy (typically <5mm ) and unwanted data cleaned from the scans. Cleaned and registered scans were converted to Pointools format and saved for CAD work. The resulting Pointools data set extended to 250 scan files and 3.5 Billion points, totalling some 52Gb of data. The required deliverables for the project were a full set of elevations and plans for each floor of both buildings. Also required was the possibility of creating accurate cross sections through any part of the buildings. DJA/GSS worked with LCRW's CAD technician to supply detailed 1:50 scale greyscale elevations of the buildings. Floorplans and roof plans were taken from the Pointools data set and transferred to CAD format, producing a series of 18 drawings detailing the layout, floor heights, ceiling and roof heights of the house and stables in detail. 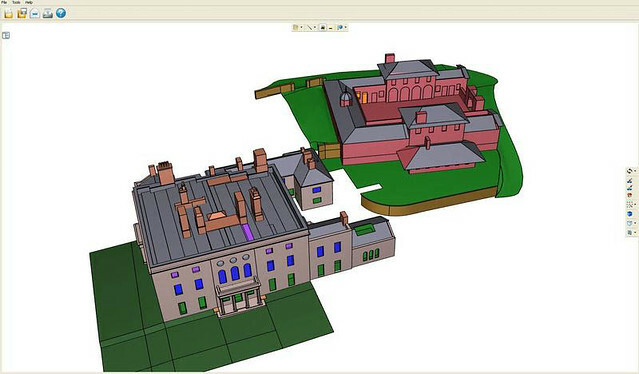 To allow the required flexibility in producing sections, DJA/GSS assembled a 3D CAD model of each room in the complex showing major details such as window, fireplaces etc. Accurately depicting the 3D structure of the building, the model acts as a space claim reference and can be interrogated by the architects for any combination of section and plan. Also supplied were Quicktime VR (QTVR) images of each room, giving a 360 degree panoramic view of the room and showing the location of detail such as light switches, smoke detectors and service runs. Working with these compact files allowed the team to create a virtual model of the building, with the QTVR files being indexed to a 2D plan. The deliverable package provides an in depth study and record of the house and stable block for future reference. It acts as a starting point for LCRW to create a master plan for the renovation of the site and for further investigation of this fascinating house by other specialists. For more images of the site and deliverables, please visit our Flickr site. Nant Eos has now been beatifully refurbished and is a comfortable country retreat.